Distance can give perspective, sometimes. Browsing in a newsagents in Australia, I came across an international weekly edition of a major UK daily newspaper. The headline was about immigration, the tabloid obsession. The paper had good news and bad news for its core readership. The ‘good’ news was a big reduction in net migration to the UK from European Union (EU) countries, while the ‘bad news’, from its pro-Brexit ‘island fortress’ perspective, was that non-EU migration to the UK had increased. 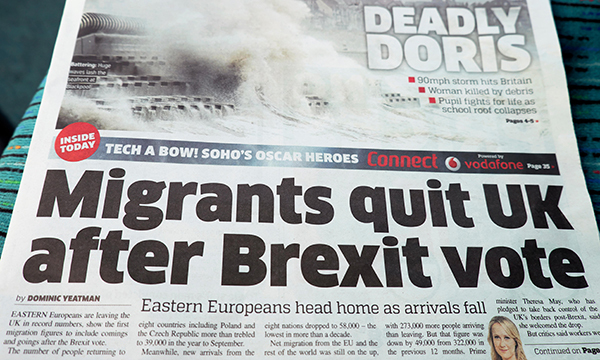 Although it seems like this stance has little do with UK nursing, the same narrative is being played out with EU nurses leaving the UK – or delaying a decision to come – because of Brexit uncertainties. Non-EU nurses from traditional source countries such as India and the Philippines are once again being targeted by UK employers, but Home Office immigration rules make it very difficult for these nurses to get into the UK. All we have left is the empty rhetoric about ‘self-sufficiency’ and somehow achieving a rapid and massive increase in the number of UK-based nurses. Any dispassionate assessment of the data on applications to preregistration nursing courses in England, on vacancy rates and on NHS nurse numbers shows a very different reality. In fact, we have self-imposed nurse shortages, not self-sufficiency. The Westminster government has supported a 25% increase in medical student places, justified by chasing this chimera of self-sufficiency. No such generosity has been evident towards nursing, where the shortages are more obvious, more widespread and more damaging. The readership of that UK tabloid risks missing the point. Without immigration of skilled younger workers, including nurses, it will be much more difficult to keep the tax base topped up and services well-staffed and viable.